We consider the fundamental problem of authenticated group key exchange among n parties within a larger and insecure public network. A number of solutions to this problem have been proposed; however, all provably-secure solutions thus far are not scalable and, in particular, require n rounds. Our main contribution is the first scalable protocol for this problem along with a rigorous proof of security in the standard model under the DDH assumption; our protocol uses a constant number of rounds and requires only O(1) modular exponentiations per user (for key derivation). Toward this goal and of independent interest, we first present a scalable compiler that transforms any group key-exchange protocol secure against a passive eavesdropper to an authenticated protocol which is secure against an active adversary who controls all communication in the network. This compiler adds only one round and O(1) communication (per user) to the original scheme. We then prove secure — against a passive adversary — a variant of the two-round group key-exchange protocol of Burmester and Desmedt. 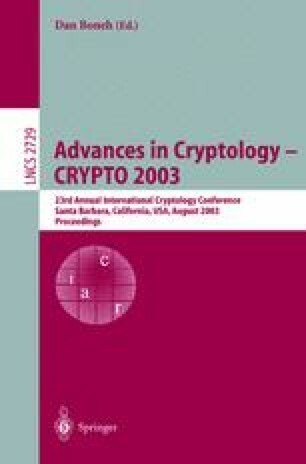 Applying our compiler to this protocol results in a provably-secure three-round protocol for authenticated group key exchange which also achieves forward secrecy.